Smile by the Beach Boys was the partially completed album recorded during the 1960s. Hailed as a masterpiece, although never commercially released, bootlegs of the album were much sort after. In 2011 the Smile Sessions were released, a compilation of what the album might have sounded like if it had been completed. Following our work on The Beatles iTunes projects, Capitol Records got in touch and asked us to produce the immersive Smile iTunes LP. Our aim was to create a truly interactive experience. 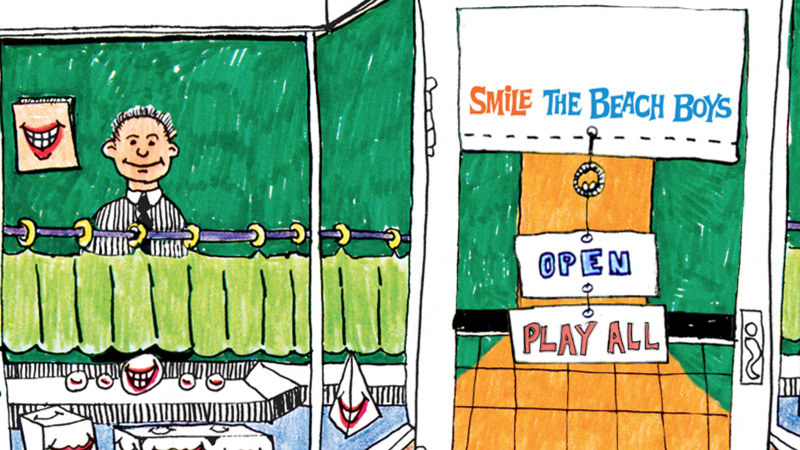 Working from the original Smile Cover we created all new illustrations of inside the shop, somewhere never seen in the original artwork. We needed to keep the look and feel of the artwork, but created our own environment in which to place the featured content. Featuring 19 digitally remastered tracks, a gallery style visualiser, over 20 bonus tracks, interactive timeline about the history of Smile, memory card game and Frank J. Holmes interactive gallery the LP was packed full of content. We wanted to make sure the digital version matched the physical box set being released at the same time, while introducing some exclusive features to make the most of the iTunes LP format. We also were commissioned to produce a trailer, highlighting the content and the great illustration the team had completed.